Each year, in and around the Orange County area, the Orange County Award Program chooses only the best local businesses. We focus on companies that have demonstrated their ability to use various marketing methods to grow their business in spite of difficult economic times. The companies chosen exemplify the best of small business; often leading through customer service and community involvement. For most companies, this recognition is a result of your dedication and efforts as well as the work of others in your organization that have helped build your business. Your team is now a part of an exclusive group of small businesses that have achieved this selection. Welcome to the Orange County Business Hall of Fame! 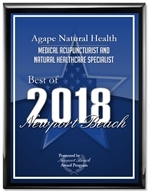 WASHINGTON D.C. | Agape Acupuncture, Inc. has been selected for the Best of Orange County | In the Medical Acupuncturist & Herbalist category awarded for OC Best medical acupuncture, acupressure, acupuncturist and herbalist. WASHINGTON D.C., June 8, 2009 — Agape Acupuncture, Inc. has been selected for the 2009 Best of Orange County in the Medical Acupuncturist & Herbalist category. The “Best of Local Business” Award Program recognizes outstanding local businesses throughout the country. Each year, the companies are identified that they believe have achieved exceptional success in their local community and business category. These are local companies that enhance the positive image of small business through service to their customers and community. Various sources of information were gathered and analyzed to choose the winners in each category. The 2009 Award Program focused on quality, not quantity. Winners are determined based on the information gathered both internally and data provided by third parties. USCA is a Washington D.C. based organization funded by local businesses operating in towns, large and small, across America. The purpose is to promote local business through public relations, marketing and advertising. It was established to recognize the best of local businesses in their community. Our organization works exclusively with local business owners, trade groups, professional associations, chambers of commerce and other business advertising and marketing groups. Our mission is to be an advocate for small and medium size businesses and business entrepreneurs across America. 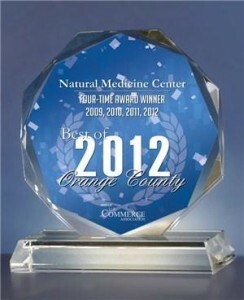 This 2012 Best of Orange County award is to recognize that Agape Acupuncture, Inc. has been selected for the 2012 Best of Orange County Awards in the Medical Acupuncturist & Herbalist category. Nationwide, only 1 in 250 (less than half of 1%) 2012 Award recipients qualified as Four Time Award Winners. I’m sure that your selection as a 2012 Award Winner is a reflection of the hard work of not only yourself, but of many people that have supported your business and contributed to the subsequent success of your organization. Congratulations on your selection to such an elite group of small businesses. The “Best of Local Business” Award Program recognizes outstanding local businesses throughout the country. Each year, companies are identified that we believe have achieved exceptional success in their local community and business category. These are local companies that enhance the positive image of small business through service to their customers and community. 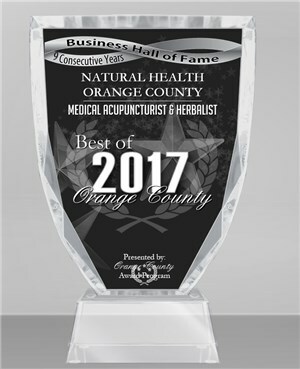 Agape Acupuncture, Inc. has been selected eight years in a row for the 2016 Best of Orange County Awards for Medical Acupuncturist & Herbalist and now qualifies for the Orange County Business Hall of Fame. Welcome to the Orange County Business Hall of Fame! 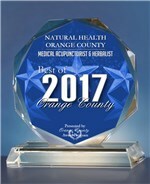 Agape Acupuncture, Inc. is among a very small group of companies that have won the Best of Orange County Award for eight consecutive years. This distinction has qualified Agape Acupuncture, Inc. for the 2016 Orange County Business Hall of Fame. To commemorate your inclusion in this elite group an exclusive Hall of Fame Award, available only to Hall of Fame inductees, has been created. What is the Orange County Award Program? Each year, in and around the Orange County area, the Orange County Award Program chooses only the best local businesses. We focus on companies that have demonstrated their ability to use various marketing methods to grow their business in spite of difficult economic times. The companies chosen exemplify the best of small business; often leading through customer service and community involvement. For most companies, this recognition is a result of your dedication and efforts as well as the work of others in your organization that have helped build your business. Your team is now a part of an exclusive group of small businesses that have achieved this selection. The Orange County Award Program is an annual awards program honoring the achievements and accomplishments of local businesses throughout the Orange County area. Recognition is given to those companies that have shown the ability to use their best practices and implemented programs to generate competitive advantages and long-term value. The Orange County Award Program was established to recognize the best of local businesses in our community. Our organization works exclusively with local business owners, trade groups, professional associations and other business advertising and marketing groups. Our mission is to recognize the small business community's contributions to the U.S. economy. 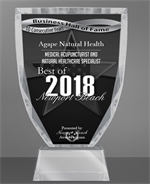 This distinction has qualified Agape Natural Health for the 2018 Newport Beach Business Hall of Fame. To commemorate your inclusion in this elite group an exclusive Hall of Fame Award, available only to Hall of Fame inductees, has been created. Over 45,000 Patients Treated | 4th Generation | Our family has been serving patients in the United States since 1980 and serving California for 35 years with great results for many difficult and degenerative diseases - Safe and Effective | Hundreds of Testimonials and Many Online Five Star Reviews | We have treated over 45,000 patients including doctors (MD & Ph.D.), nurses (RN), chiropractors, licensed acupuncturists, healthcare professionals and post-graduates. Serving patients in Costa Mesa, Santa Ana, South Coast, Irvine, Newport Beach, Newport Coast, Corona Del Mar, Huntington Beach, Tustin, Aliso Viejo, Mission Viejo, Laguna Woods, Laguna Beach, Laguna Hills, Laguna Niguel, Brea, Yorba Linda, Santa Ana, Anaheim, Talega, Trabuco Canyon, Villa Park, Portola Hills, Balboa, Buena Park, Westminster, Garden Grove, La Habra, Anaheim Hills, Silverado Canyon, Placentia, Fullerton, Orange, Rancho Santa Margarita, Seal Beach, Ladera Ranch, Lake Forest, Fountain Valley, Stanton, Cypress, La Palma, Los Alamitos, Monarch Beach, Cote De Caza, Dove Canyon, Foothill Ranch, Dana Point, San Juan Capistrano, San Clemente, Orange County, and the surrounding Los Angeles County and San Diego County. We are licensed acupuncturist by the state of California. We have many testimonials from patients from Agape Acupuncture, Inc., herbs, acupuncture, and acupuncturist serving you with gentle loving care and top quality medical excellence and medical testimonial of Agape Acupuncture Clinic, Agape Acupuncture, Inc., Natural Health Orange County Santa Ana, South Coast Market Place, Acupuncture, Herbs, and Nutrition Costa Mesa.